I’ve been a user and a fan of Twitter since I got introduced to the service back in 2008. 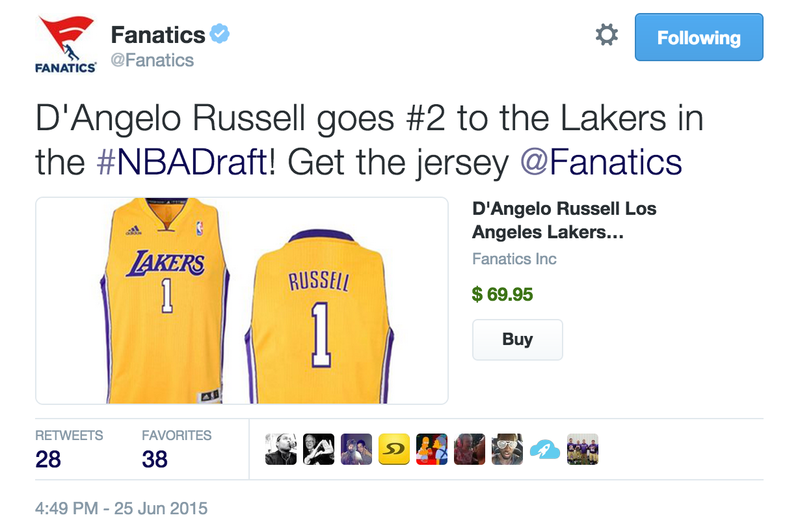 So working closely with Twitter to get the Twitter Buy Button integrated with Fanatics was already excited. But getting a retweet from the original brain behind he service is not something I could have imagined. Let alone dreamed! Last week, for the NBA draft, we prepared 4 tweets for 5 of the first round draft teams to have the shirt of the player who was just drafted being featured in the tweet. Within the tweet, you could buy the shirt right there, with no click out to a different website, check out right there! As Twitter is going to behave more and more like a platform, these integrations will happen more and more within the tweet. As long as we can scale volume in the items sold, I’m happy testing this out! Here is a screenshot of the buy button integration in the tweet, working at the Twitter platform. With below the original tweet as embedded into WordPress, as the buy button does not work outside of some of the walled garden of Twitter! I have a soft spot for Twitter e-commerce, since I’ve been walking around with ideas in my head from the moment I bought the domain ShopTwits.com. Inspired by the quick launch, and early success of StockTwits.com, I bought the domain with the intend to build a shopping application on top of Twitter. Back then I was still working for eBay, so e-commerce was running through my veins. I dropped the ideas, and stopped working on it as I was too busy with family, friends and new work at Airbnb. 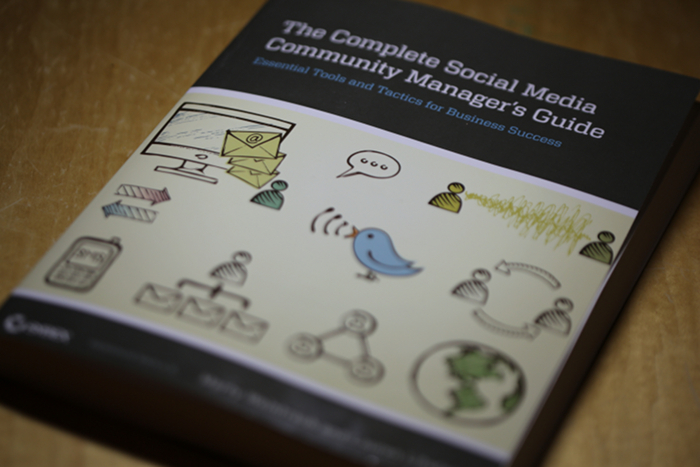 But I never got the concept of real-time commerce on Twitter out of my head! And what do you think, the current (interim-)CEO of Twitter takes “notice” of our attempts to build a new service on their platform, and retweets one of our tweets with the buy button integration. I never would have thought I would be so happy with the action of the man who thought out this awesome service I’ve been using for the last couple of years, and has been taking the world by storm… at least the breaking news section of media! The outcome of the campaign wasn’t that great yet! It does show the opportunity to get much higher engagement on tweets that are retweeted by famous and broadly followed accounts. 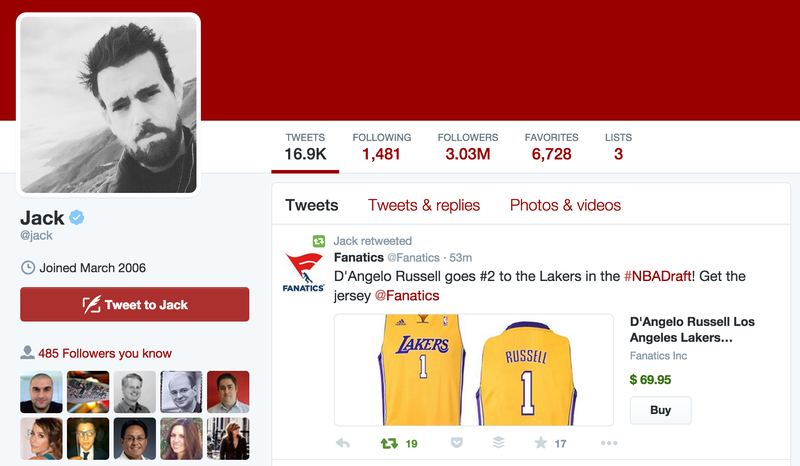 The other 3 tweets got single digit engagement, where the Lakers jersey tweet engagement shot up as soon as Jack shared it. Next time we will try with a more general product, see what kind of volume we can get out of it.Our strategy to test out the new feature on Twitter was probably not the right one, since we picked a product and a difficult event. Combined with Twitter advertising, targeting the right audience, we could have done better! I foresee Twitter having a real successful product feature, which for e-commerce players is a welcome new channel. 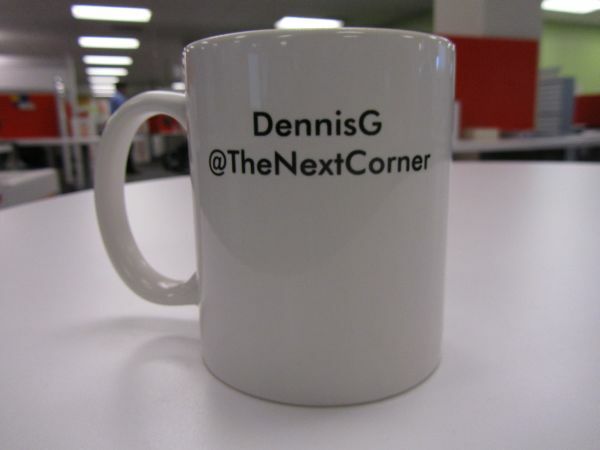 I’m a big believer in the potential for e-commerce on Twitter, hence my early thoughts buying the domain shoptwits.com and constantly thinking how to develop a product around this. T-Commerce will take off, where I expect sports to play a big role. When your team wins, buying a jersey or championship tshirt is just one tweet away! Twitter Engagement Testing > Are you using images for maximum impact? Based on a post from MG Siegler, in which he describes the practice of posting images with text on Twitter, I wondered how my tweets with embedded images did in terms of engagement. A quick check with Twitter analytics gave me two interesting data points of last week tweets; One tweet got a massive engagement rate according to Twitter analytics. Normal tweets I post most of the time get around than 3-4% engagement rates, outliers are scoring up to 10%! This one got a whopping 17.5% in the first 24 hours! The tweet was posted on a Sunday, as I shaved my head that day, this might have limited the number of people who saw my tweet! Overall, the number of impressions this tweet got was around 40% lower than tweets I post during the work week. The engagement could be higher than my average, just because I have a lot of followers who know me. Shaving my head was a first, so it could be the engagement was just off the charts because they wanted to see my bald head. All of the engagements were organic. I did not pay for any of the engagements. 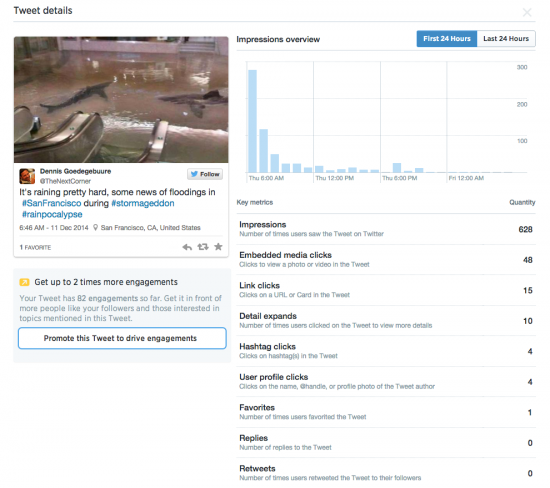 With these detailed Twitter analytics, it’s becoming easier to start optimizing for engagement on your tweets. More visuals, less boring content!Twitter Engagement Testing > Are you using images for maximum impact? Let me know what your engagement looks like on your tweets, would love to hear! Now, off to the results. 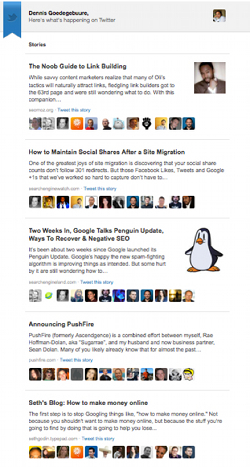 What works better, a Twitter button right up there after the 1st paragraph, or one after the full post? So these results are far from what you could expect on any blog post, however, it might give you an idea on how to test how likely your audience is willing to share your content with their followers. If you don’t test your way into a viral factor sharing, why you keep trying to publish content..? Two years ago I had the pleasure of being invited to speak at SMX Sydney. I happily accepted as I had never been in Australia. 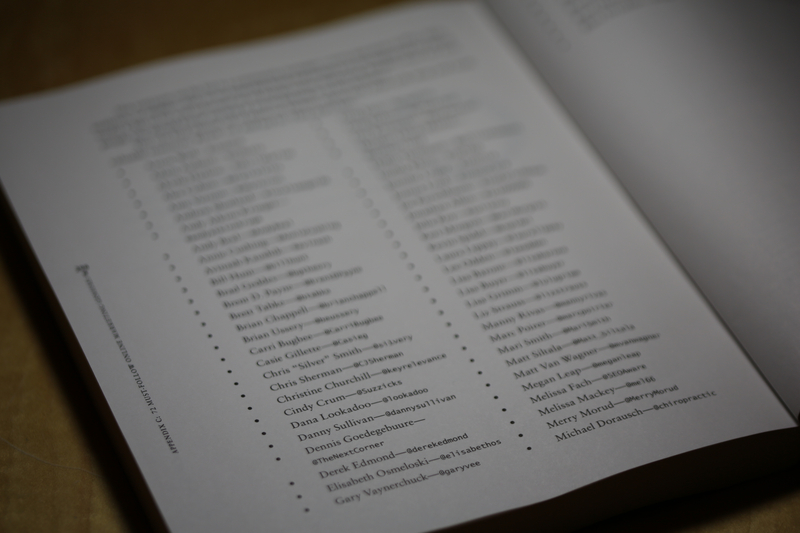 On my trip to Down Under, I had the opportunity to get to know some of the other international speakers more closely. I already had met Marty Weintraub before, and had seen him speak multiple times, which is always a treat. But on the trip to Sydney Australia, Marty and I exchanged some of the most interesting conversations and grew closer. Now fast forward to today, I welcome any opportunity to catch up with Marty over breakfast to discuss the latest ideas we have on Online Marketing. While reading Marty’s first book: Killer Facebook Ads: Master Cutting-Edge Facebook Advertising Techniques (Amazon Link) , I added another dimension to my experience. You see, I’ve seen Marty speak at multiple occasions, which helped me simulate his way of presenting the whole book in my head while I read it. I finished the book in no time, at Weintraub speed. I’m not saying you should write a book and include a list of people just to put them to work and help you creating buzz for your book. I’m sure Marty and Lauren have learned a great deal from all of the people on this list, I know I have! A little over a year ago, Laura interviewed me just before I was speaking at SMX West. This does mean the social signals which will be captured by the Google Toolbar, the Chrome browser and any other way click stream data is being captured by the Google, will be of an advantage for the t.co domain, which is 301 redirected to Twitter. Also, some people might copy paste the short URL from Techmeme on their own site, which will bring a huge advantage to Twitter. More data to capture. When you control the mail, you control.. information !! What has this to do with Twitter becoming the Toll Man of Social Media? Simple, Twitter will control the information flow of the links that are spread over one of the most popular social media websites breaking the news in real-time. Before this change, other URL shortners were controlling the traffic, now Twitter will be able to control every short URL which goes through their system. There is even an added SEO benefit for Twitter here. If anybody uses the t.co short URL on their website, the page rank will first flow to the t.co domain, after which it gets redirected to the destination site using a 301-redirect. However, Twitter does control all these t.co url’s, which could be re-purposed and redirected to their own domain, as soon as the target url goes dead! The move from Twitter to use their own t.co URL shortner is allowing every website owner to track better how Twitter is contributing to the total traffic referrals. Tracking where your users coming from is essential to understand how effective any marketing campaign really is. In my last job, working for the very large e-commerce website eBay, there were many occasions any marketing program would need to submit estimated ROI numbers to secure the budgets. Loads of times there were more marketing programs submitted than there was budget available. Any smart organization would make decisions on budget allocation based on maximizing ROI of their investment, and eBay was no-different. So, when you cannot even track what the return on investment was for a Twitter social media campaign, the teams would not even be able to secure the budget needed to kick off the campaign. Every Social Media Marketing team is trying to defend their investments, campaigns or budgets, especially when the economy is going south. It’s hard to justify any budget for a Twitter campaign, if you are not able to proof there is incremental traffic, conversion or revenue coming out of the investment. But now, with the increased insights of the Twitter referrals, the social media marketing teams will be able to point out how much incremental traffic was driven through the Twitter campaign, and what the ROI is on the budgets invested. The changes are a big win for any social media marketing team fighting for to proof their effectiveness, especially those in large corporation with a lot of processes and red tape. This argument is along the same lines as the previous one, however it’s got more to do with the actual product development needed for feature enhancements on large websites. With the increased insights of how Twitter is contributing to business growth, more product features focused on deep Twitter integration might make the priority list of the product roadmaps. A deeper Twitter integration will benefit Twitter in a big way, as the team at Titter will get their hands on more data to play with, more feedback from other product teams on their API’s, and probably more ideas on what features Twitter would need to develop to grow further. I’m sure you can come up with more reasons why this move from Twitter is a big thing, and where Twitter and others can benefit from the increased insights of how Twitter drives traffic to your websites, who is the influential person spreading your links on Twitter, and how much incremental traffic your Twitter social media campaign has brought to your business. I wold love to hear your thoughts, where the comments are open for feedback. Twitter can be very helpful in a world where SEO SERP’s are changing based on location, personal preferences or keyword search sequence. If you have a question, you can get Instant Twitter Feedback if you simple ask your question on Twitter. As I was logged in, and was using my usual browser, Firefox, I quickly launched Chrome and did another search on Google.com. 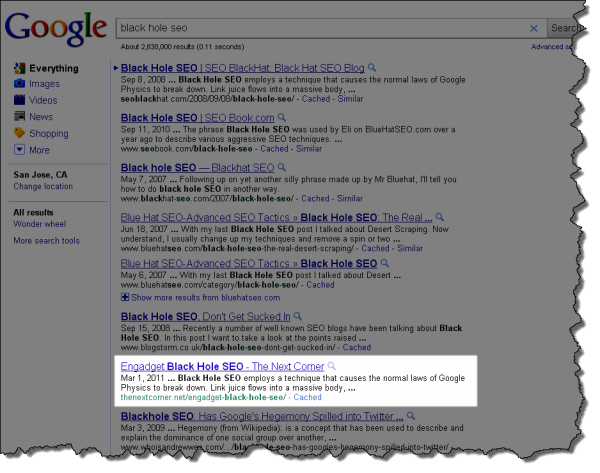 This time, my post about Black Hole SEO was not ranking on #3, but lower on the page. Still the post was ranking on the first page of Google. New RSS subscribers. When your followers don’t know you write a blog, they might start reading you on a regular basis. 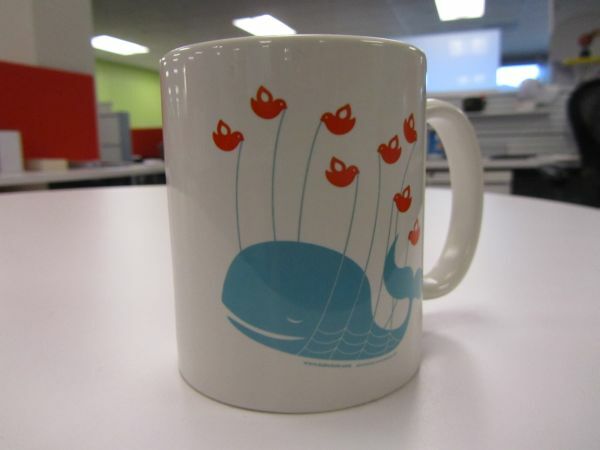 I just ordered a customized #FailWhale coffee mug at http://bit.ly/c2lfUz through @YiyingLu supporting the artist is key! Yiying Lu is the artist which created the picture of the Fail Whale, which became a well known pop culture phenomenon on the Internet due to the fact the Twitter team chose this drawing as the standard picture for when Twitter was down or over capacity.